Is it a Field Sketch? 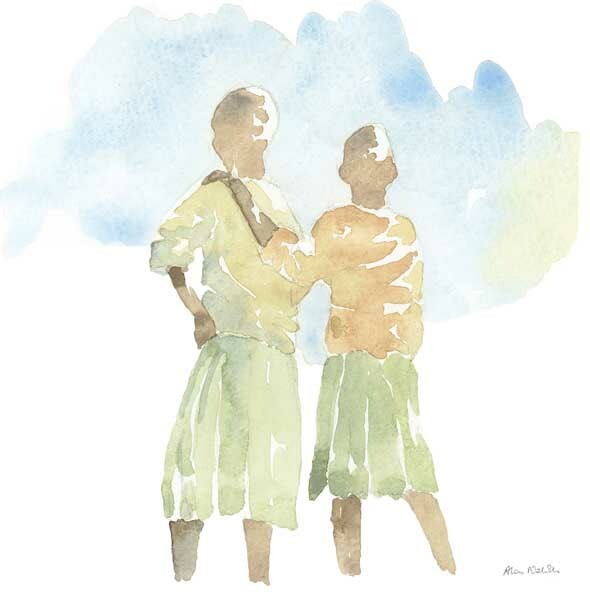 On each visit to Africa I fill several sketchbooks with pencil and watercolor art. I have always referred to these artworks as ‘field sketches’ but as my work evolved I began to wonder if ‘sketch’ is still the appropriate term. Lets go back a bit. For 10 years I have marketed my art through my website and social media sites because I want people to see, enjoy, learn from, and buy my work. Sketching in the field from life, without any photo or video reference, is vital to my artistic process; great fun; expands my knowledge of animal anatomy and behavior; and makes me a better artist. From a marketing perspective it also separates me from artists who work only in the studio from photos, and I try to make this crystal clear to everyone who sees my work. In a face to face conversation I can explain all this quite easily, but when you see my work briefly on the internet, I need to get this point across as quickly as I can, so terminology becomes very important, hence my use of the easily understood term ‘field sketches’. Over the years, as my skills improved, I began to experiment with my field sketches. First, I started thinking more about composition while I sketched. The underlying pencil sketch for Cheetah Trio was created while I watched wild cheetahs in Botswana. But the cheetahs were lying further apart than they are shown in my sketch. I moved them closer together to create a better composition. I used both my ability to sketch from life, and my compositional skills to create the field sketch you see. Maybe you think I should sketch exactly what I see, but I would suggest that every piece of art has been composed to some extent by the artist. Even a field sketch artist has chosen which pose to sketch – if they sketched exactly what they saw, you would come across more sketches of animals relieving themselves! Secondly, as you see in Cheetah Trio, I began adding watercolor to my pencil sketches. As animals don’t remain still for lengthy periods of time, I usually have to do this back at camp – adding color from memory and imagination in varying proportions. So according to the definition of a ‘sketch’, my works in pencil definitely qualify – they are executed hastily and contain only essential details. I add watercolor in a more leisurely manner, so does the painted piece still qualify as a field ‘sketch’? Or as field work? Or as a watercolor painting? So…does any of this matter? When you search for ‘field sketches’ online, what do you expect to find? This entry was posted in Art Safaris, Blog Posts, Field Sketches, For Artists, Uncategorized, Watercolors and tagged artist, field sketch, watercolor on August 4, 2017 by Alison. I believe that Painted Dogs (African wild dogs) are one of the most difficult sketching subjects in the African bush, because when they are active, they are hyper-active! The better I know an animal, the better my sketches will be, so by the end of my most recent trip to southern Africa, having seen 4 different packs, I was able to capture some of the more entertaining, playful moments. While the dogs were playing, leaping over grass and chasing, I was watching rather than sketching, but I am then able to create sketches of particular moments, from my memory, a few minutes later. That is how this sketch was created. This Original Field Sketch is watercolor and pencil on watercolor paper, 11×14″ and priced at US$300. Limited Edition Giclées are also available, priced at US$120 each. Only 10 copies are available, printed using archival inks on watercolor paper, 11×14″, all signed and numbered by me. Tomorrow’s sketch is of carmine bee-eaters! 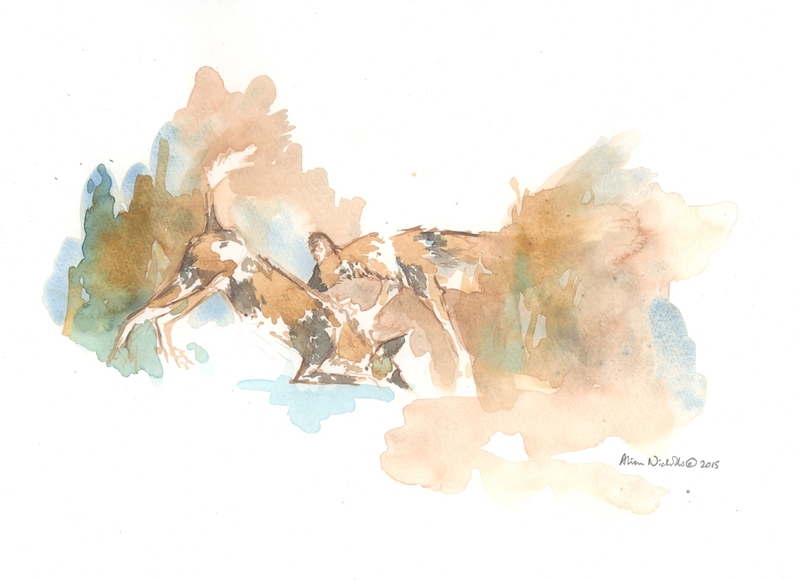 This entry was posted in African Wildlife, Blog Posts, Field Sketches, For Artists, Painted Dogs (African wild dogs), Watercolors and tagged African wild dog, alison nicholls art, field sketch, painted dog on November 11, 2015 by Alison. Artist + Elephant = Magic! As an artist who sketches African wildlife in the field, it can be difficult to get this kind of photo. If I’m on my own, I never manage to get these kinds of photos. So its wonderful to have a husband who takes these kinds of photos for me – often without my knowledge! 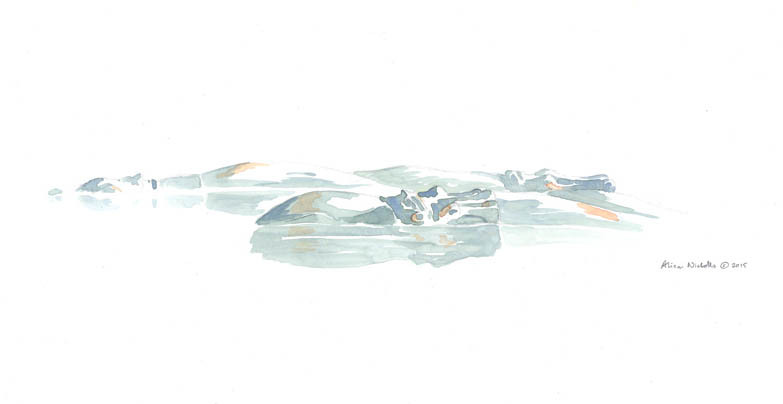 Alison Nicholls sketching in Mana Pools, Zimbabwe. Photo by Nigel Nicholls. I can never have too many photos of me sketching elephants. Thank you, Nigel! This entry was posted in African Wildlife, Art Safaris, Blog Posts, For Artists and tagged Alison Nicholls, elephant, field sketch, Zimbabwe on October 13, 2015 by Alison. 3 Artists. 3 Hours. 3 Styles. Bryant Park in New York City was the scene of this sketching outing. Some unsuspecting park goers provided the models, and 3 very different artists interpreted the scene very, very differently. First – a pen sketch by Hazel Jarvis, who uses simple lines to create beautiful, expressive sketches. Next – a graphite drawing by Rachael Grimm, who uses tone, shading and line to create her more detailed drawings. Finally, a few of my watercolor sketches, created with a rigger or outliner brush. It allows fine lines, but when sketching, the long hairs of the brush don’t allow for complete control of the line. 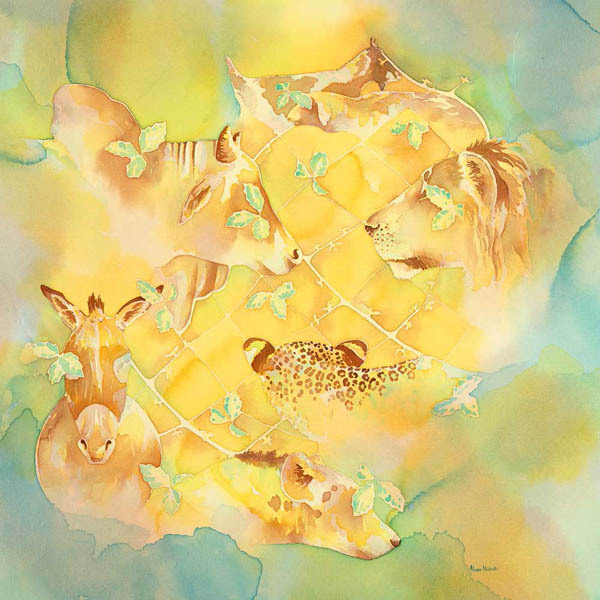 I was experimenting with this and plan to use it on this year’s Art Safari as I think it will be a great, expressive way to capture wildlife in watercolor. It amazes me that we all sat there together, at the same table, in the same park, and the resulting artwork is so different in each case. When you learn to draw, you are often told to draw what you see, not what you think you see. I agree with that completely, but it does beg the question, are we seeing different things? I believe we are. And that’s what makes art so exciting! See more of Hazel’s Art. See more of Rachael’s Art. See more of My Art. This entry was posted in Blog Posts, For Artists and tagged field sketch, New York on June 12, 2015 by Alison. 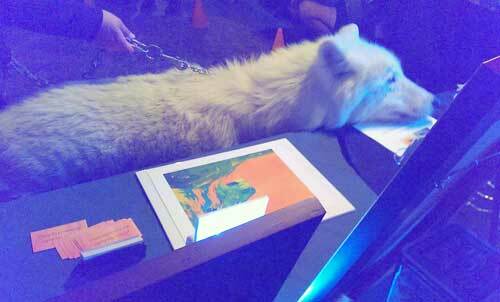 Wolf + Sketchbook + Spring = Art Safari! My next Wolf Sketching Workshop at the Wolf Conservation Center in South Salem will be May 3rd from 9am – 12 noon. Join me and learn how to capture a live wolf in your sketchbook! Any level of sketching experience (or none!) is just fine. In addition to sketching several of WCC’s ambassador wolves, you will have a chance to see the critically endangered red wolves and Mexican gray wolves. Please contact me if you have any questions, or use the link below to sign up for the workshop. Spring is finally here, so join me for a wonderful morning watching and sketching wolves! 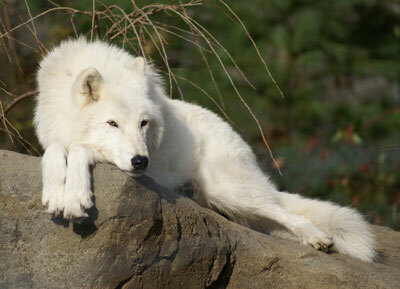 Atka (above), Zephyr, Alawa, Nikai and I, hope to see you there! Wolf Sketching Safari, May 3, 9am-12noon. $70 per person. Pre-Registration is Required. This entry was posted in Blog Posts, Conservation, For Artists, Workshops and tagged field sketch, wolf, wolf conservation center on April 21, 2015 by Alison. It was at the African People & Wildlife Fund in Tanzania, where I began sketching people and now I can’t seem to stop! The funny thing is that I usually have much more trouble sketching people in western clothing, than I do sketching the Maasai in Tanzania. I wondered why that was and realized I was falling for a common trap – sketching what you think you know, rather than what you actually see. I know western clothes. I wear them myself. So I thought I could sketch people wearing western clothing without spending too much time looking. Wrong! So, on this trip to MOMA I made a conscious decision to start looking for the simple shapes that I use when sketching in Africa. And wouldn’t you know it, my sketches were so much better! Check out the work of my friends and fellow artists, who joined me on my MOMA sketching trip: Hazel Jarvis and Rachael Grimm. This entry was posted in African People, Blog Posts, For Artists and tagged field sketch on April 17, 2015 by Alison. Thank you to everyone who has helped make my book such a success! I have received so many orders that I will need to print more copies. If you have placed an order, your book will be in the mail as soon as I’ve signed it. Thank you again for your support! If you not yet placed an order but would like a signed copy… please remember that after April 30, the book will be available on Amazon.com, for a higher price. At the moment a signed copy is available from me for only US$35. If you live in the USA, you can place an order here. Shipping within the US is US$6. If you live outside the USA, please drop me an email and I can send you a shipping quote (shipping to the UK or New Zealand is $15). A donation is made to the African People & Wildlife Fund from every sale. 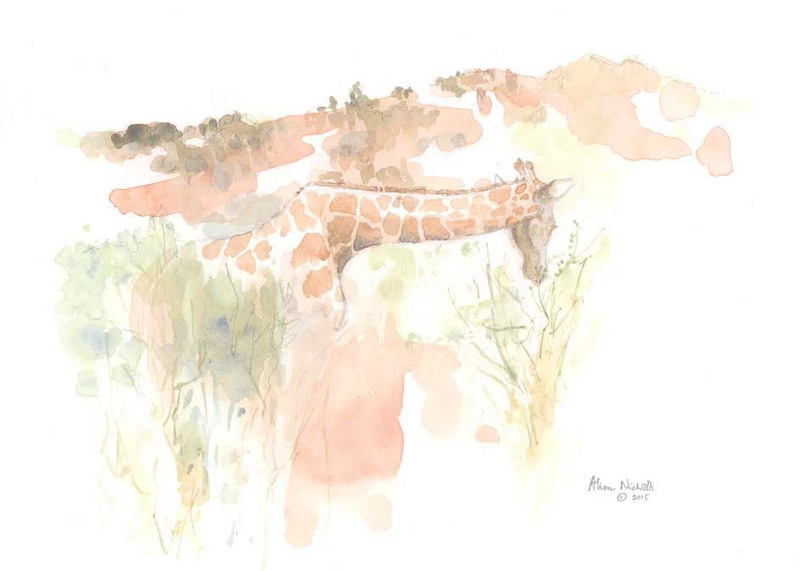 See more of my African Field Sketches. 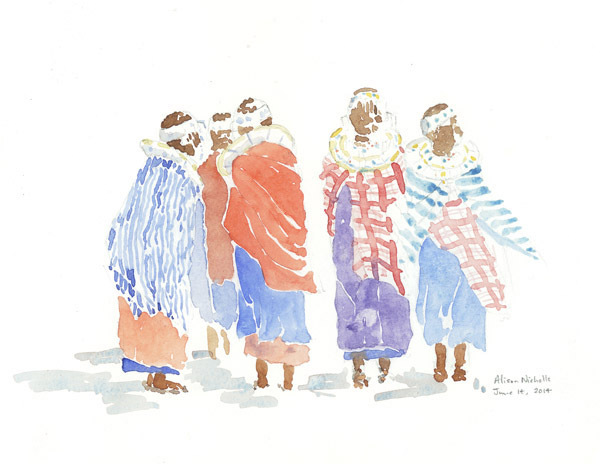 This entry was posted in African People, Blog Posts, Conservation, Uncategorized and tagged Art Books, field sketch, tanzania on April 14, 2015 by Alison. Join Me To Sketch Wolves! This entry was posted in Blog Posts, Conservation, For Artists, Workshops and tagged field sketch, wolf, wolf conservation center on April 3, 2015 by Alison. The results are in, and they were pretty overwhelming. 74% of voters chose the Yellow Cover for my new book!!! I’m glad I asked you to vote for the cover design, because my instinctive choice was the White Cover! Some of you will argue that I should go with the white cover because it was my choice and I am the artist, but I have to disagree. If almost three quarters of you chose the yellow cover, then I’m going with you – after all, one of the purposes of this book is to publicize my art and the work of APW. And the best way to do that is to have a larger number of people pick up the book! Because the results of the poll were so clear, I decided to close the contest early. So the name of the winner was pulled today. And guess what – the winner is another artist! Shukas, a sample page from my upcoming book. The winner is Ray Brown, a talented artist and friend. You should check out his art too – after you’ve ordered a signed copy of my book! Field Sketches, a sample page from my upcoming book. Pre-order a copy before April 30, 2015, and you will get a personally signed copy for the stupendously, ridiculously, low price of only US$35 excluding postage ($6 in the USA). After April 30, the book will be available on Amazon.com but at a higher price. I am ordering the books now and they will available late April or early May. A donation is made to APW from every sale. Living Walls, a sample page from my upcoming book. If you live outside the USA, drop me an email or leave a comment and I will let you know shipping costs for your country. Pre-order Your Signed Copy for US$35 before April 30, 2015. 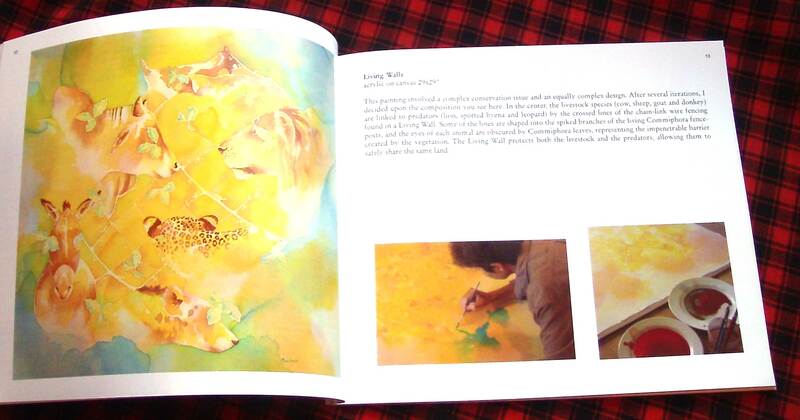 This is the 1st book in my Art Inspired by Africa series, and it features images of art created as a result of my visits to the African People & Wildlife Fund (APW) in Tanzania. There are full-page images of my field sketches and studio paintings, all accompanied by personal notes or journal excerpts. The foreword is by Dr. Laly Lichtenfeld, APW Executive Director, and other APW staff have also contributed to their comments to the book. Photographs and text explain specific APW programs on the Maasai Steppe and my work with local school children. The 46-page book is printed on full-color premium lustre paper, in a softcover 8×10″ landscape format. A donation is made to APW from every sale. Congratulations to Ray Brown! (check out his amazing graphic art using the link). 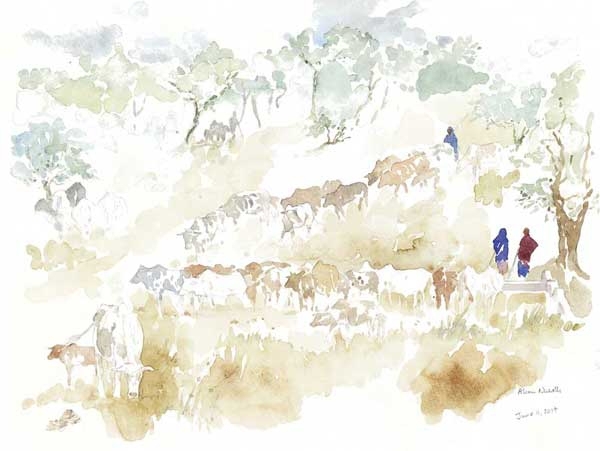 This entry was posted in African People, African Wildlife, Blog Posts, Conservation, For Artists and tagged African People & Wildlife Fund, Art Books, field sketch, maasai, tanzania on March 28, 2015 by Alison. Take a Look Inside my Art Book! Work on my book is progressing nicely so I thought I’d give you a sneak peek at a few pages. 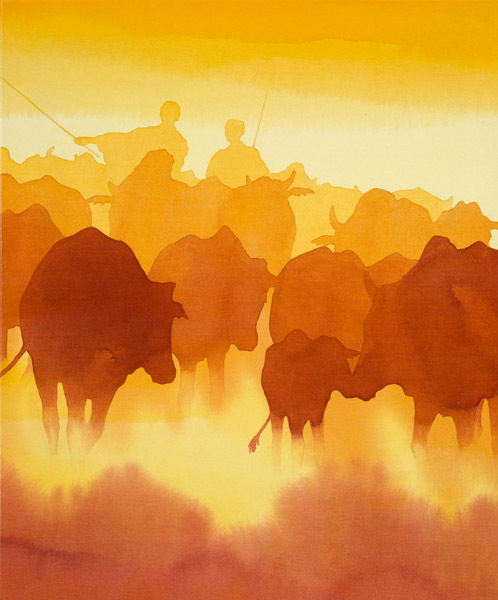 Art Inspired by Africa – An Artist Visits the African People & Wildlife Fund features field sketches created at the African People & Wildlife Fund (APW), studio paintings inspired by my visits, excerpts from my field journal, a foreword by Dr Laly Lichtenfeld (Exec Dir. of APW) and details of APW programs. But one lucky person can win a signed copy by helping me choose the cover design. There are two options shown below – white or yellow. You can vote by leaving a comment here or on my Facebook page. I’ll be announcing the winner and the cover choice on March 31st! Art Inspired by Africa Covers. Tell me your choice in a comment and you might win a copy! Now I really must go and finish writing the Introduction! This entry was posted in African People, African Wildlife, Blog Posts, Conservation, For Artists and tagged Africa, APW, field sketch, tanzania on March 18, 2015 by Alison. Send a Scholar to School! I haven’t run any marathons recently. Not even a half marathon. I haven’t done any long sponsored walks, although I really should be paid for the amount of time I spend walking my German Shepherd dog. I have not even entered any sponsored hot-dog eating competitions. (My dog’s ears just perked up. You can be paid to eat hot-dogs, wow, humans are Amazing!) What this all means is that I have not asked you to sponsor me to do anything. So yes, you guessed it, I am about to appeal for your money. But not for me. Instead I want you to consider a donation, of any amount, to help send a scholar to school. In Tanzania! The scholars I refer to are Noloholo Environmental Scholars. The African People & Wildlife Fund in northern Tanzania created this scholarship program, to allow children from the Maasai Steppe the opportunity to go to a good boarding school in Arusha for their secondary education. Most of these children would have very little opportunity to continue their education beyond Grade 6 (end of primary school) if they did not receive the scholarship. During their vacations from boarding school they mentor other students who want to follow in their footsteps – and there are many who want to follow in their footsteps. As you can imagine, this program is changing lives. Some of these children may be future conservationists, but whatever they choose to do, they will be raising living standards and expectations not only for themselves and their families but for their communities as a whole. So please take the time to look at this link and see if you can help with a donation of any amount. This entry was posted in African People, African Wildlife, Blog Posts, Conservation and tagged Africa, African People & Wildlife Fund, Alison Nicholls, conservation, field sketch, tanzania on March 11, 2015 by Alison.